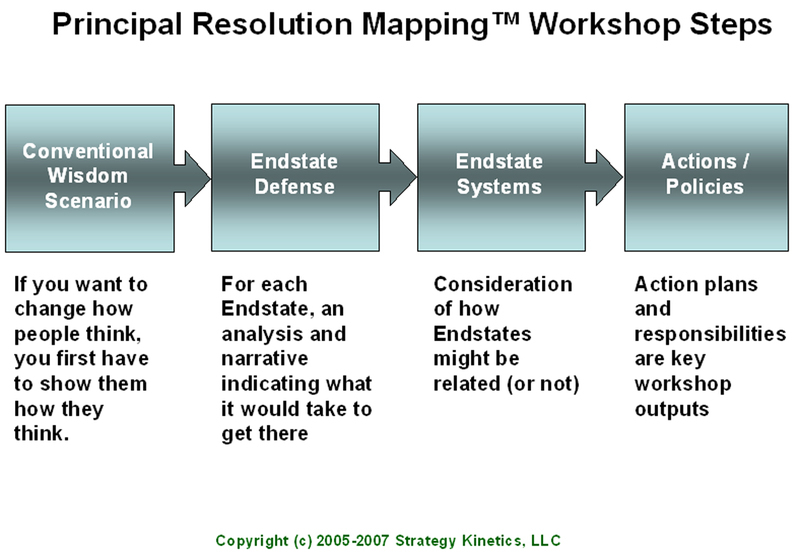 Some Events are considered by Resolution Mapping workshop participants to be important to multiple scenarios. 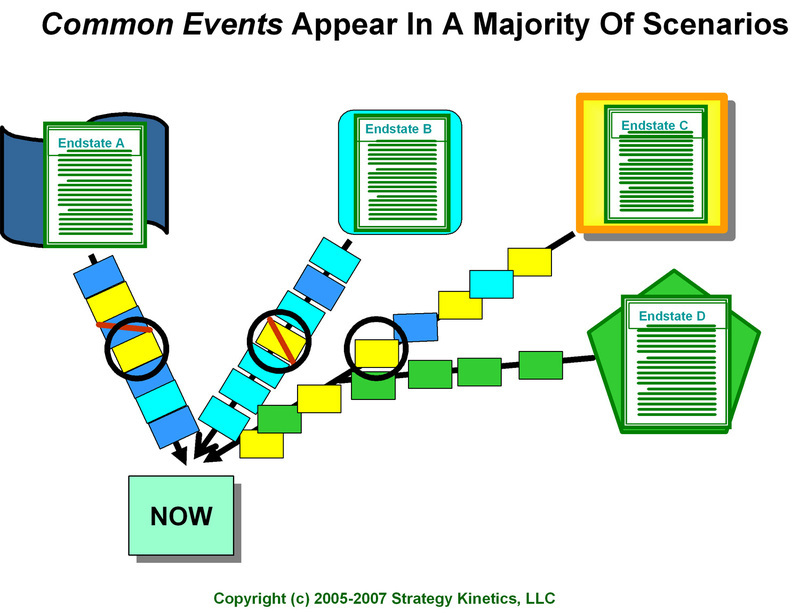 These Common Events are noteworthy because multiple stakeholders have an interest in the outcome. For example, in a project to address America and Global Climate Change, a Common event might be that the Congress mandates average 50 MPG for cars produced beginning 2030. In scenarios addressing healthcare in America, a Common event might be that by 2011, 20 states mandate health insurance for all. Various actors may work toward making or influencing the Event to happen; others may work toward preventing its occurrence, as in the case of a Must Not Happen event. Consequently, Common Events and the issues they represent will usually receive a lot more attention because more actors have a stake in the outcome. After identifying those events that Must [or Must Not] happen, each team then creates a narrative: a story that describes how the world got to be “this way” rather than some other way. They then defend their scenario in a short presentation to all the participants. Who were the key actors? What was the timing of their actions? How did the actions of major actors interact with the actions of other actors? What were the key conflicts? Were they resolved or ignored? If conflicts were resolved, how? Each team of 4 to 7 people works backwards: assuming that assigned their Endstate has already happened, they determine what it took to get there. Events are specific observable occurrences that could happen. For each Event, some actor or actors, such as a nation, NGO, a company, or a foundation, must be able to influence the outcome, at least in principle. Events are printed on cards with a headline, a date, and a brief description elaborating the headline. The + or – after each date in the Events indicates that the year is approximate (plus or minus 1 year in a majority of projects). 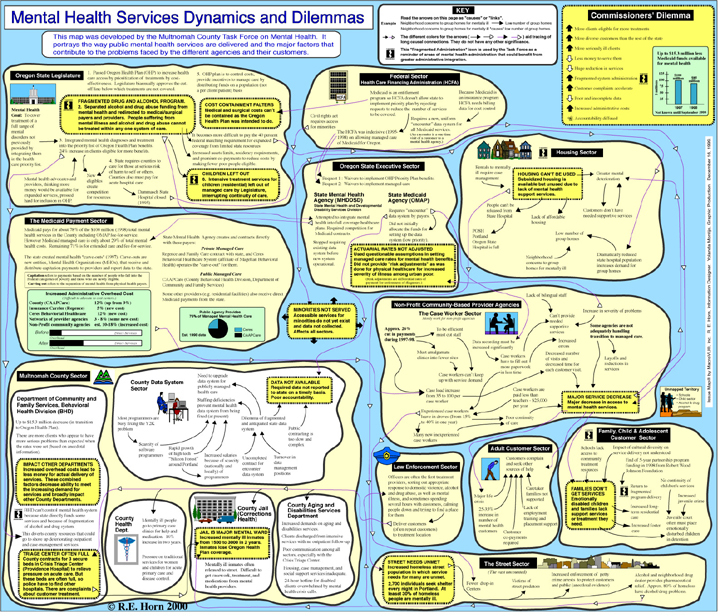 This is another a series of "blogicles" on how Mess Mapping™ and Resolution Scenario Mapping processes can be used to represent, analyze, evaluate Wicked Problems and then to choose actions that ameliorate the Wicked Problem at hand. 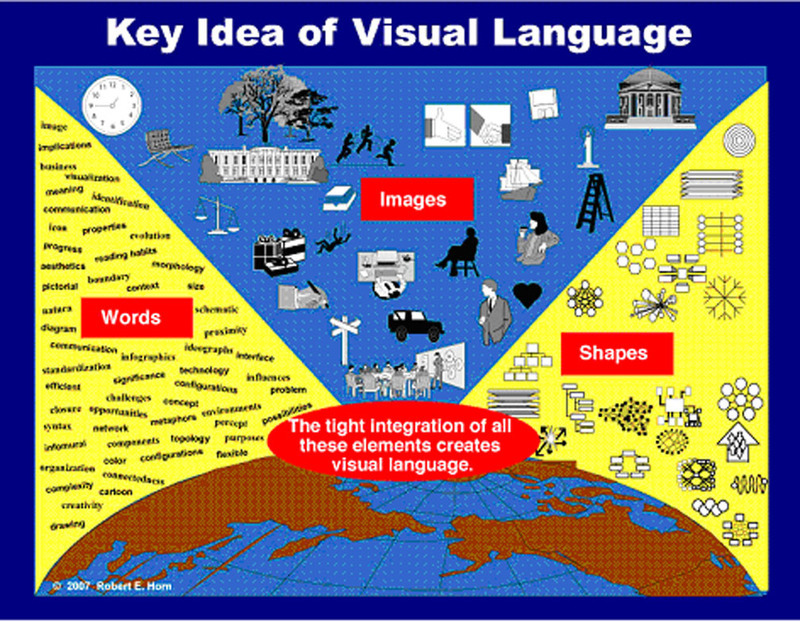 Have outlined the Mess Mapping process, we now turn our attention to Resolution Mapping™. Endstate: a 1 or 2 page internally consistent description of an extreme, but plausible future of a Wicked Problem, industry, organization, market, etc. A set of 3-6 divergent Endstates that span the outcome space. The time horizon of the Endstates will depend on the Wicked Problem addressed. Event: a hypothetical occurrence at a specific point in the future. 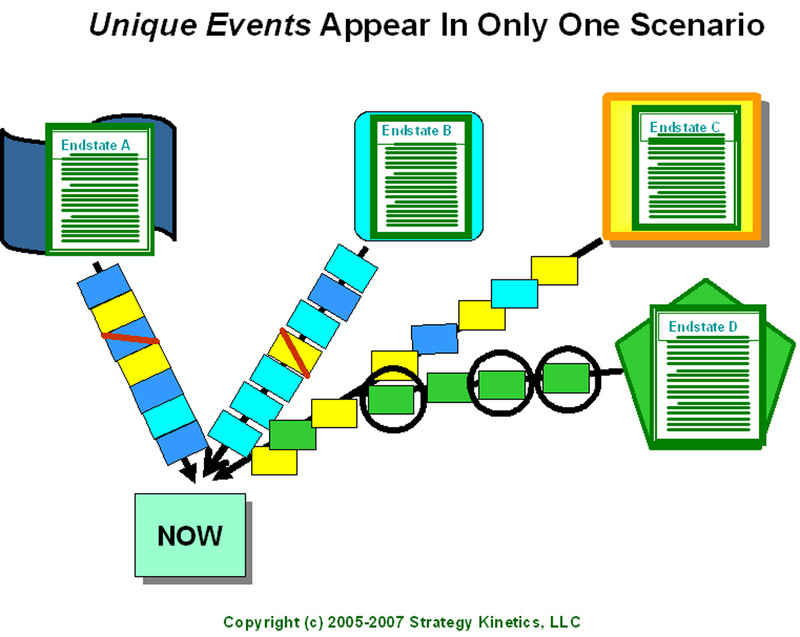 Events have to be observable; one has to be able to determine whether the Event has occurred or not. 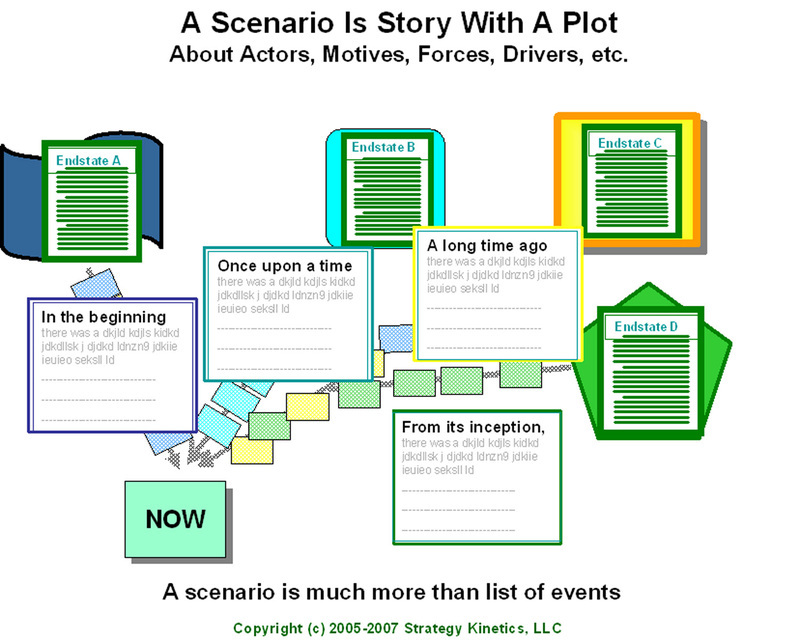 Scenario: a narrative describing the actors, drivers, motives, and key events that lead logically from the present to a particular outcome or Endstate. A Scenario answers the question, how did the world evolve from today to this specific Endstate? 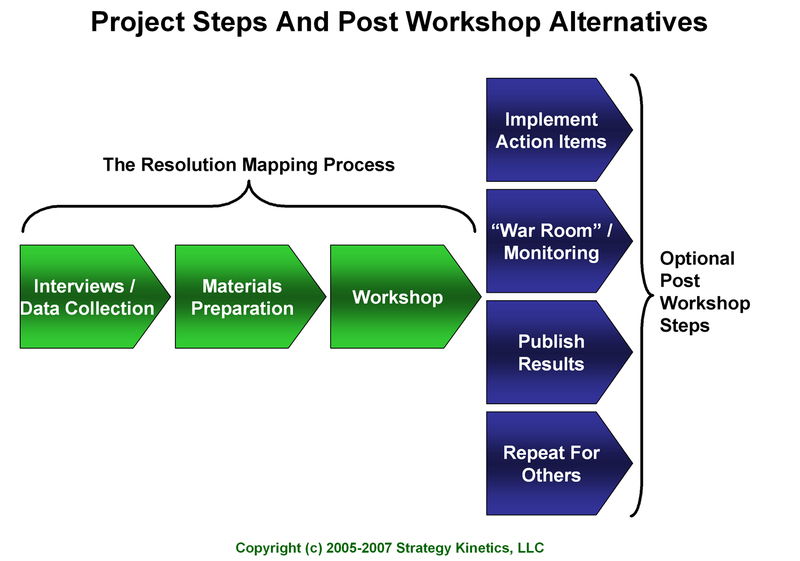 Conventional Wisdom Scenario: a scenario representing the initial beliefs of participants at the outset of a Resolution Mapping workshop process. If you want to change how people think you first have to show them how they think. 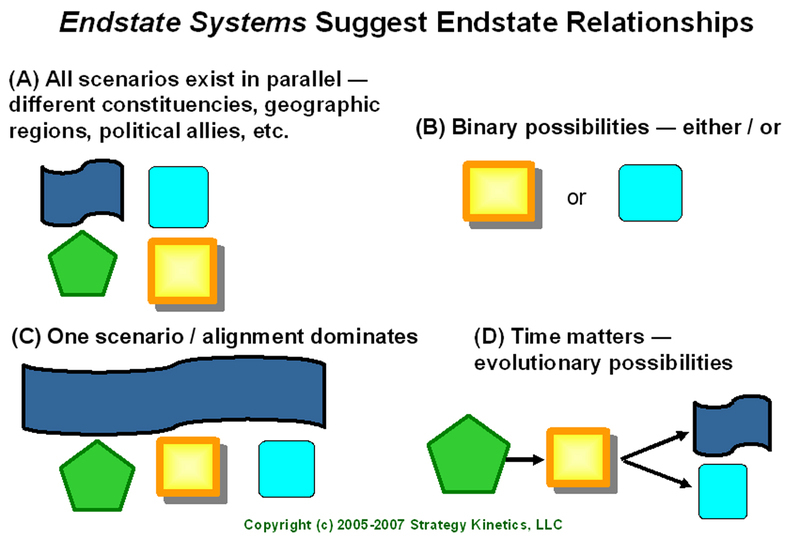 Endstate System: A graphical or Visual Language representation of how Endstates might be related to each other, for instance, evolving over time. 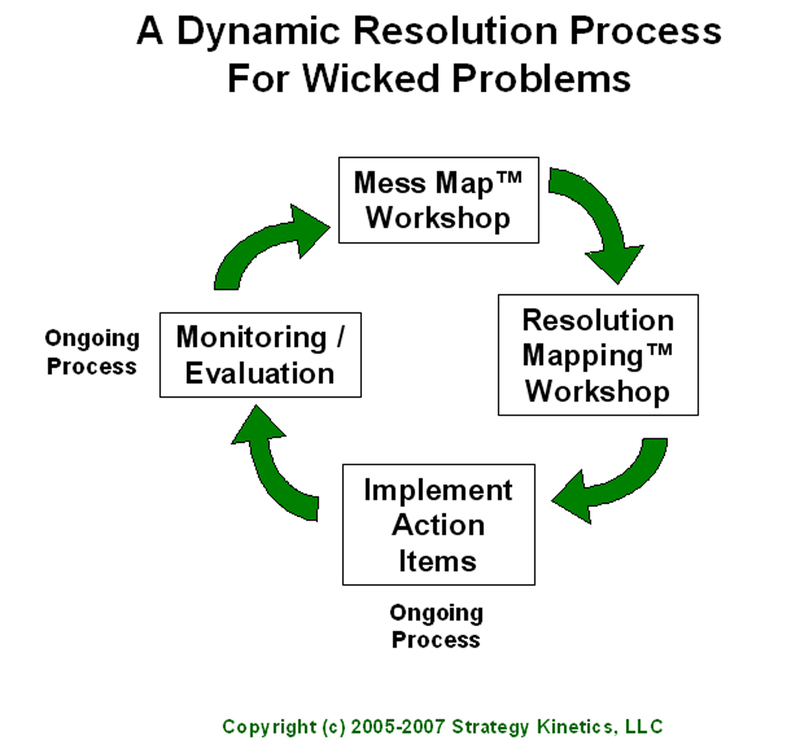 This is the first of a series of "blogicles" on how Mess Mapping and Resolution Mapping processes can be used to represent, analyze, evaluate Wicked Problems and then to choose actions that ameliorate the Wicked Problem at hand.